The Walking Dead: Season One and 400 Days can finally be purchased in one place with Game of the Year exclusives. Telltale's The Walking Dead is one of those games deemed so successful that it warranted a re-release for almost every platform. Today you can find the complete series digitally on PCs, current-gen consoles, and even your iPhone, although if you like buying games on physical discs you probably need to order the 400 Days DLC chapter separately. Thankfully, whether you're a newcomer to the series or simply want your episodes in one place, Telltale is offering a special edition just for you. The Walking Dead: Game of the Year Edition is out today and includes all six episodes, behind-the-scenes videos, and access to the original musical score. "This all-inclusive edition of The Walking Dead's first season is an incredibly exciting package for fans both old and new, and one of the best ways to catch up on the story before the upcoming premiere of Season Two," said Telltale CEO Dan Connors. "With the inclusion of 400 Days and access to behind-the-scenes content and the emotionally-charged score from our long-time friend and composer Jared Emerson-Johnson, we're proud to offer this definitive edition of Season One." 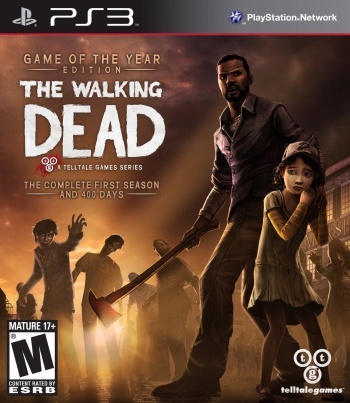 The Walking Dead: Game of the Year Edition is available for PC, PS3, and Xbox 360, and will only set you back $29.99. The price is a little steep if you already purchased the last boxed edition, but at least the extra bonuses help to soften the blow. New players of the series (to whom I say, good luck holding back your tears) should be more than satisfying with this definitive edition, at least until Season Two gets its frustratingly exclusive digital episodes. Hopefully retail customers won't have to wait quite so long this time around.